This Midsummer, let’s bring the swing back! We are pleased support a night of fun and dance at the Lincoln Center, this July. Even if you are new to these energetic group dances from Gujarat in western India, you’ll quickly find your place on the dance floor during this spirited night of culture, community, and live music. Garba, with its repeating claps, twirls, and circular patterns, and raas, performed with sticks and rotating partners, are traditionally danced during the fall festival of Navratri and before weddings. Fun and social, they have been passionately embraced by young people across the Indian diaspora in recent years. Both are easy to learn, especially with our instructors on hand. 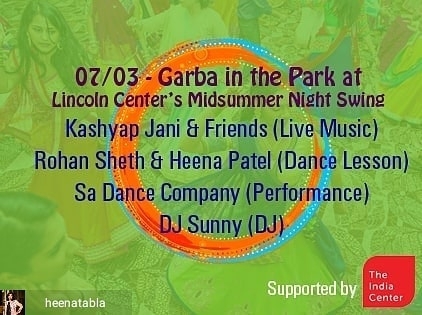 Watch a beautiful performance of garba by the The Sa Dance Company before joining the instructors and Sa in a night of dancing to music by Kashyap Jani and Friends.